What is another word for dissipate? To throw apart or spread abroad: to scatter: to squander: to waste. dispel, disappear, fade, allay, resolve. 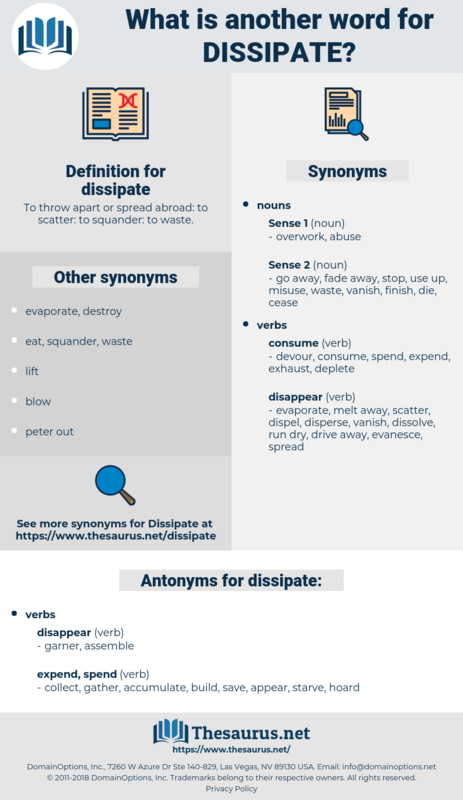 disperse, eliminate, Eliminating, assuage, vanish, eradicate, remove, mitigate, Mitigating, erase, banish, defuse, address, obliterate, ease, diffuse, disseminate, diminish, clarify, overcome, cease, relieve. collect, gather, accumulate, build, save, appear, starve, hoard. meet, conglomerate, protect, skimp, preserve, unite, unify, economize, cluster, agglutinate. In translation only a strictly classical language should be used; no word of slang, or even word of modern origin should be employed; the translator's aim should be never to dissipate the illusion of an exotic. The military movements set on foot were thought to be like the ringing of bells and firing of cannon to dissipate a thunderstorm. 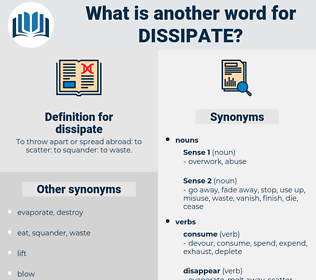 diaspididae, dispute, decapitate, disc-shaped, dash-pot, disputed, ditch spade, despot, decapod, dissipated, duck pate, despite, dog bite, dish-shaped, dasypodidae, dogsbody, djibouti, decapitated, decapoda, dog food, disbud, day shift, disk-shaped.